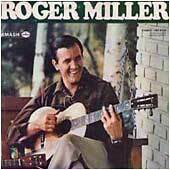 Roger Miller was a tremendous songwriter as well as musician and actor. He is most recognized for writing novelty tunes such as "Dang Me" but had many beautiful songs including "Husbands and Wives" which Brooks & Dunn have a super rendition of. He was quite the entertainer and left us with many great songs that we still enjoy playing and singing. These Roger Miller lyrics and chords are intended for your personal use only. He was a funny and very talented guy, we miss him.